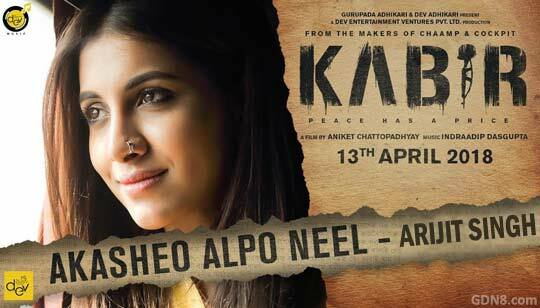 Akasheo Alpo Neel Lyrics from Kabir The Song Is Sung by Arijit Singh Starring: Dev And Rukmini Maitra Music composed by Indraadip Das Gupta And Akasheo Olpo Nil Song Lyrics written by Srijato. News about Akasheo Olpo Neel Kabir Bengali Movie Song Lyrics: Great news for all "Arijit Singh" lovers, He is come with romantic bangla song from Kobir. The lover boy Dev And gorgeous Rukmini Maitra is the starring Main Lead Role In This Movie. Presented by Gurupada Adhikari and Dev Adhikari and Executive Producer is Pritam Chowdhury. Track Programming: Amit -I shan, Mixing and Mastering: Amit Chatterjee Guitar Design: Ankur Mukherjee.